Straight by definition (a plomb), it defies the mischief of the wind with nonchalance (aplomb). In the outdoor version Aplomb is almost a return to the roots. Aplomb is an outdoor suspension lamp with direct down light. Outdoor concrete diffuser, consisting of an original amalgam colored with pigments and achieved by manually casting the fluid mixture in a mold. The lighting technology part inside the cone consists of an aluminium housing which acts as the dissipator for the COB LED screened by a transparent polycarbonate lens. Electrical cable coated in black neoprene for outdooruse, without canopy,fitted with terminal board and Schuko plug. The Aplomb outdoor is available in Pompeian red, sage green and light grey. Suitable for wet locations. 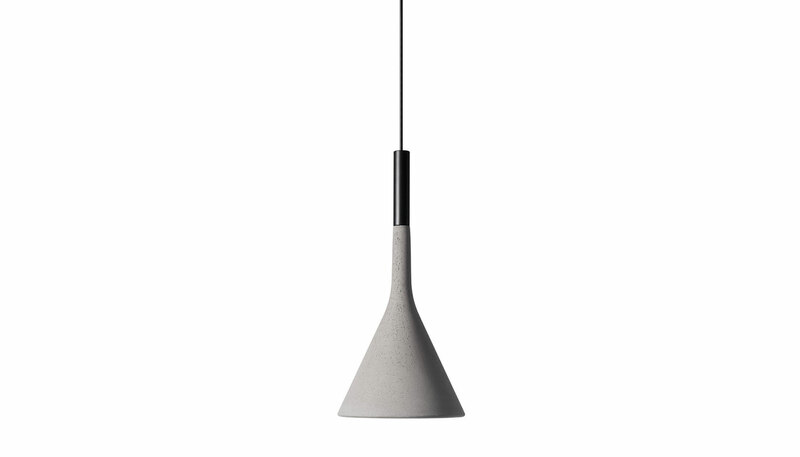 Manufactured by Foscarini. Overall Dimensions: 6.5" Diameter, 14" H, Cord length: 122"